Precautions: The first principle of yoga is ahimsa: nonviolence. Practice nonviolence to yourself by not causing your body any physical pain during your practice. If you are under medical supervision, check in with your practitioner before embarking on a yoga practice. When faced with a great loss our body, mind and spirit may feel broken. Yoga can bring us back together, one piece at a time. The word yoga means union, or “to yoke.” The practice of yoga is more than a physical exercise, it helps make us whole again. You don’t need to do any difficult postures, be flexible or athletic. All you need is your breath and your body. There are many ways grief impacts your physical body, and while each of us will have a unique grief experience, the benefits of yoga are universal. It is likely that your body is experiencing an extreme amount of stress. Yoga can reverse this reaction, and help your body return to a state of balance. When we are grieving it can be hard to start anything new, but when you consider that it will improve how you feel, setting aside the time will be less difficult. Find your calendar and schedule your yoga practice. To whatever extent possible, try to make this appointment with yourself a priority. A regular yoga practice during the acute phase of grief will help you begin to restore your daily routine, plus the more often you practice, the sooner you will reduce physical and emotional suffering. It may be difficult at first to show up regularly especially with the “monkey mind” that comes with grief. You will find that in a short about of time your body will begin to feel better, your mind will begin to settle and your mood will become lighter. Preparation: Find a quiet space in your home that is warm and free of clutter. Turn off the phone, and tell anyone in the house that you need to be undisturbed during your practice. You may also invite them to join you. If you like, put on some calming music or use a recording of the ocean as background. Step 1: Set your intention for practice. Why do you want to practice yoga for grief? Most people come to yoga during troubled times to relieve suffering, ease physical pain or to heal their spirit. Find your reason for practice and write it down either in your calendar or in a place where you will see it often. Step 2: Schedule thirty minute sessions on the mat five times over the next week. Consider it a victory even if all you do is sit on your mat and cry the whole time – just try to visit your yoga mat at the same time each day. Showing up is enough. Step 3: Don’t worry about the postures; focus on your breath and move naturally. Begin by practicing the body scan exercise. Spend a period of time moving and stretching your body in response to any tension or tightness you discover. Don’t worry about doing specific yoga postures this week unless you are already familiar with them. For now, simply do what your body tells you to do, and allow your breath to be steady and regular. If your breath becomes shallow or stops, back off from whatever you are doing. Your breath will let you know if your body can handle the stretch. Don’t push it, and be gentle with yourself. Remember it is a practice. You don’t have to do it perfect! Use the audio below, or practice your own series of postures. 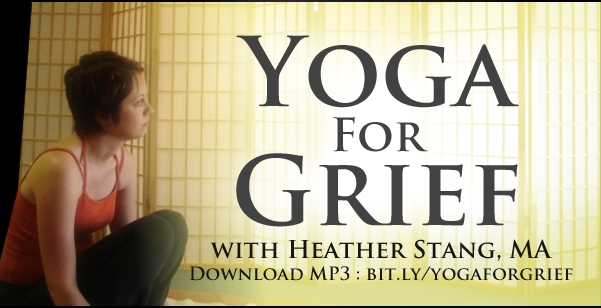 >> Download Yoga for Grief, and other guided meditations, with Heather Stang. Step 5: Receive your yoga practice. Reserve the last 5 to 10 minutes of your practice to rest in savasana. Savasana instruction: Lay on your back. Place a rolled up blanket under your knees, let your arms rest on the floor beside you. Cover yourself with a blanket so you don’t get cold. Rock your head from side to side until you find that just-right resting place. Come into stillness. Soften your breath and body. Do nothing for at least 5 minutes. When you are ready to come out, roll onto your side and gently bring yourself up to sitting. Connect with your breath, and gently open your eyes. Place your hands on your heart, and thank yourself for practicing. Step 6: Check-in with a buddy. Designate a friend who you can check in with after your yoga practice. This could be a friend who practices yoga with you, or one of the people who offer to help you during your time of grief. This help you commit to a regular schedule, but it will also reground you if the emotions of practice feel overwhelming. Yoga can be relaxing, but it can also bring emotions and memories to the surface of your awareness. It is useful to face your feelings when they arise, but it is equally important to only take on what you can handle. Regularly checking in with a loving, compassionate friend after your yoga practice will help you integrate your experience and help you connect with another human being, an important step on the road through grief. After your yoga practice, write down your reflections in a notebook or Mindfulness Journal. You can keep your yoga journal private, or share it with your check-in buddy.